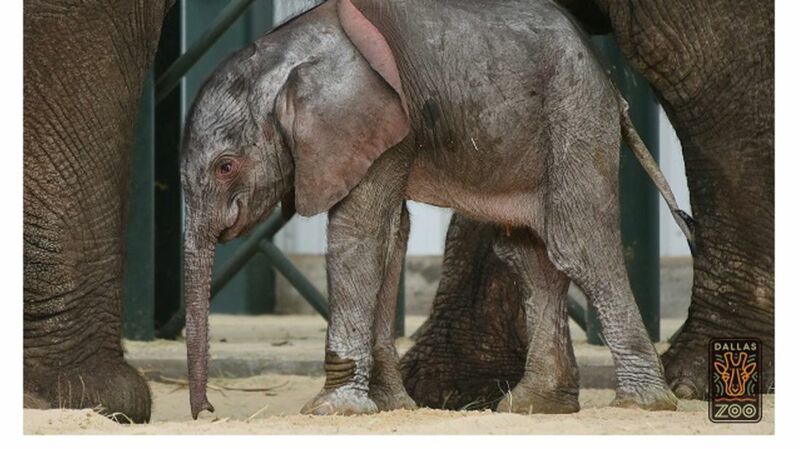 There’s no smoking allowed at the Dallas Zoo, but if there were, it would be time to pass out cigars: Mlilo the African elephant gave birth to a healthy, if small, male calf earlier this month. Mlilo (pronounced “ma-LEE-lo”) is herself quite new to the zoo. The 14-year-old elephant was brought to Dallas this spring as part of a rescue effort from drought- and poaching-stricken Swaziland. At the time of her transport, zoo officials believed she might be pregnant, but it seemed unlikely, since the bull elephants in her home territory had all undergone vasectomies. Moving any animal can cause it stress, but the risks are increased when that animal is pregnant. Ultimately, the zoo decided to bring her to Texas, where they could ensure that she at least had enough food and water. Once Mlilo arrived, zoo staff treated her and the other new arrivals from Swaziland with extra-special care, ensuring that they had everything they needed to be healthy. The TLC paid off; all five newcomers are doing well. And at 10:15 p.m. on May 14, Mlilo brought her calf into the world. For now, the baby will enjoy private time to bond with his mother and the rest of the herd, out of public view.